Here's an interview with someone who formally worked with Jordan Dice , the 15-year-old who ... (9/3/2005) Live from the internet, its your best of Weblogs, Inc. Since you are not giving an "F" on the report card of the N-O mayor, and to the La. 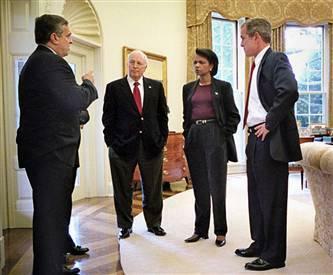 Governor your "F" for Bush Alone cannot even be considered serious. It is pure partisanship and exploitation of those poor victims. To the author, dead on point again. Keep up the good work... To Popeye... What would you give the Mayor of New Orleans and the Governor of Louisiana "F"s for? Did you assume city and state governments would be able to handle the situation until the feds decided to show up? They did everything that they could. The US government has it hands full with this one, so it is obvious that city and state governments would be overwhelmed in very short order. Thanks Rebel. Glad you appreciate the writing/reporting. To All I Can Stand: The Mayor of N.O. deserves an F? You are heartless, negligent of the facts, and devoid of reality. Please supply facts I am missing. And let's see, I give mayor "F" and I am heartless. You give Bush an "F" and you are not. You get an "F" in logic. The mayor missed an opportunity to use hundreds of buses for evacuation per the pre-disaster plan. Thousands more would have been gone before Katrina hit. The mayor realizes this blunder and is now apologizing for his disrespect to Bush. Look, blame can certainly be placed all around, including with the Mayor. However, had he done what you said with busses that would only have made a small hairline dent. This was a disaster of catastrophic proportions, which could only have been preoperly dealt with by the federal government. The Mayor does not have authority over National Guard, Army, FEMA, federal funds, etc. The MAyor did his best with what he had and under unbelievably tragic and dire circumstances. Don't compare him and his resources to Bush and the Fed.